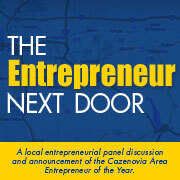 Cazenovia College will host ‘The Entrepreneur Next Door’ panel discussion and networking event on Wednesday, April 11, from 6:30–8:30 p.m. in the Morgan Room of Hubbard Hall on campus. The event is free and open to the public. The keynote speaker is Michael Hickey, a 2001 graduate of Cazenovia College and an EPA Environmental Champion Award winner. Hickey will debut the trailer for Teflon Town, a documentary film based on his experience exposing drinking water contamination in Hoosick Falls, NY. A group of panelists, moderated by Jason Emerson—editor of the Cazenovia Republican, will discuss social entrepreneurism and giving back to the community. The event will again include an award for the ‘Entrepreneur of the Year’. This year's award will recognize an entrepreneur(s) who, in addition to successfully managing one or more businesses or organizations, has had an impact on the community. This impact may come in the form of giving back to the community and/or playing a significant role in addressing an issue concerning Cazenovia and the surrounding area. The ‘Entrepreneur of the Year Award’ is given by Cazenovia College with the support and collaboration of the Cazenovia Area Community Development Association, Cazenovia Chamber and the Cazenovia Republican. • Kelly and Kevin McGreevy—Cazenovia Bagel Co. Cast your vote for ‘Entrepreneur of the Year’ at cazenovia.edu/entrepreneur-vote. Voting ends Friday, April 6 at 4 p.m. If you can't make it to the event, you can watch it online at https://livestream.com/cazenoviacollege/EntrepreneurNextDoor2018.